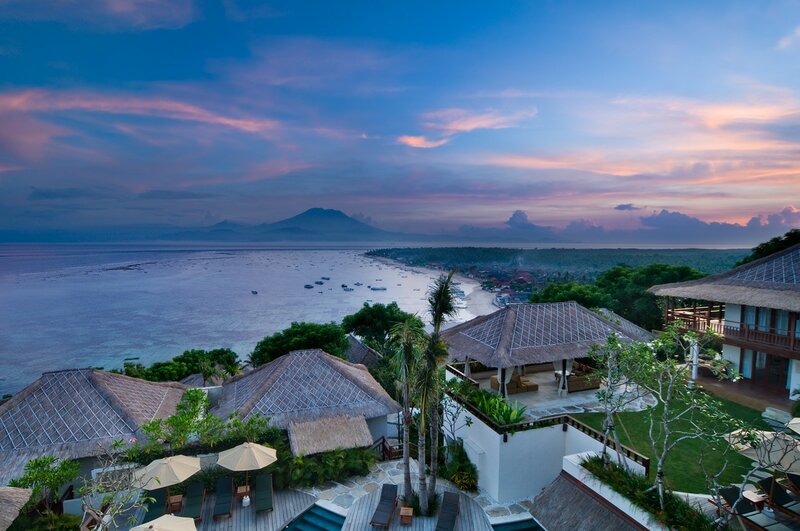 "Perched on the coral hillside above Jungut Batu Village Beach, our boutique eco-friendly resort offers a pristine uninterrupted panorama view across the Badung Strait to the magnificent silhouette of Mount Agung. 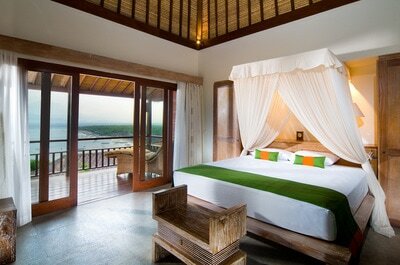 Distinctive Balinese architecture and custom crafted furnishings feature a mixture of natural Lembongan stone and coral carved work, all designed by Indonesian artisans. Surrounded by lush tropical gardens while honoring local integrity traditions in the architecture, the resort provides luxurious style villas, accommodation, and facilities. 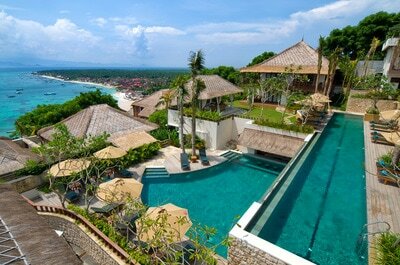 Batu Karang Lembongan Resort & Day Spa encompasses 24 luxury villas & suites, three pools including a waterfall and swim-up bar pool, a gym, day lounge, steam room, & three restaurant venues. 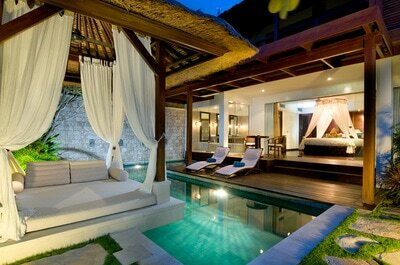 Among the six types of luxury accommodation which includes the Occasion/Wedding Suite, One Bedroom Villas, Superior One Bedroom Villas, Twin Shares, Suites, and the Three Bedroom Villas. 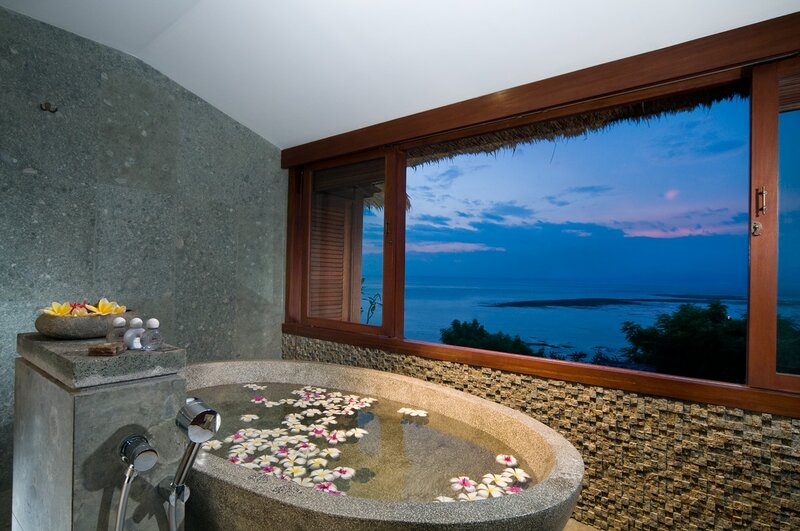 These can be reserved individually or combined using connecting doors to accommodate your needs whether it be couples holidaying together, singles, or small to large families. 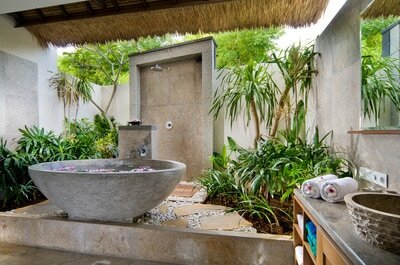 Guests can escape & relax at Lulur Spa, an eco-conscious retreat offering natural treatments and products. Be prepared for the total Balinese spa experience of traditional massage, signature facials, sensual hair treatments and refreshments. 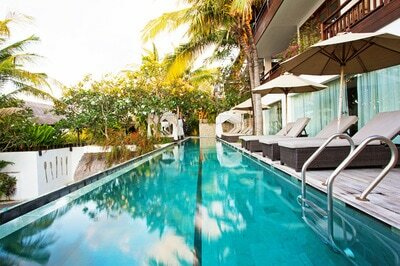 Muntigs Bar & Restaurant offers a fine food and wine experience with a variety of International and Asian cuisine. Set around an infinity edge pool overlooking the beautiful bay, surf breaks, beach, village and Mount Agung, creates a spectacular view to enjoy whilst experiencing a delightful breakfast, lunch or dinner. The Balcony at Muntigs Bar & Restaurant is a place of serenity, perfect for breakfast, lunch, & dinner. 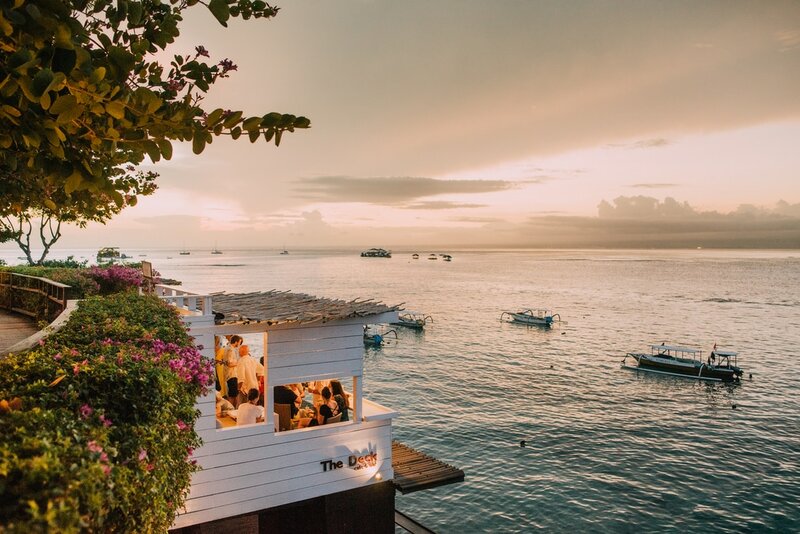 The Balcony is set apart from the local island bustle, perced up high above The Deck Café & Bar with the mystical Mount Agung scenery overlooking the sea and stretches of seaweed. 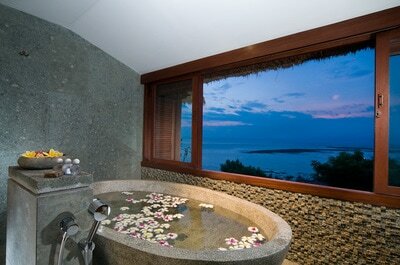 Watch the surfers ride the waves, paddlers come and go, and boats sail away. At night, The Balcony is best enjoyed under the beautiful hanging tree lanterns that boasts a sophisticated, warm and cozy atmosphere. 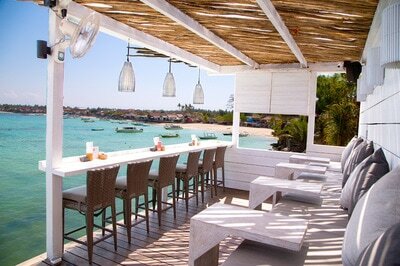 The Deck Café & Bar is set along the boardwalk waterfront & is a favourite spot for the savvy travellers of Nusa Lembongan. Indulge in the taste of gourmet baguettes, paninis, freshly baked pies, pizzas, home baked cakes, gelato ice cream, fresh juices, smoothies and real coffee. 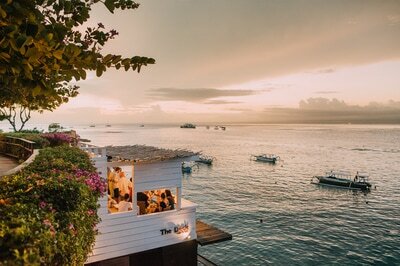 Enjoy the sunsets lounging around listening to smooth tunes sipping on a delicious cocktail while the island life passes you by, recently voted one of the top 10 Bali Sunset Bars by The Asia Collective. The Howff whisky, gin & wine bar is tucked away from the Island bustle & is an authentic Scottish experience. 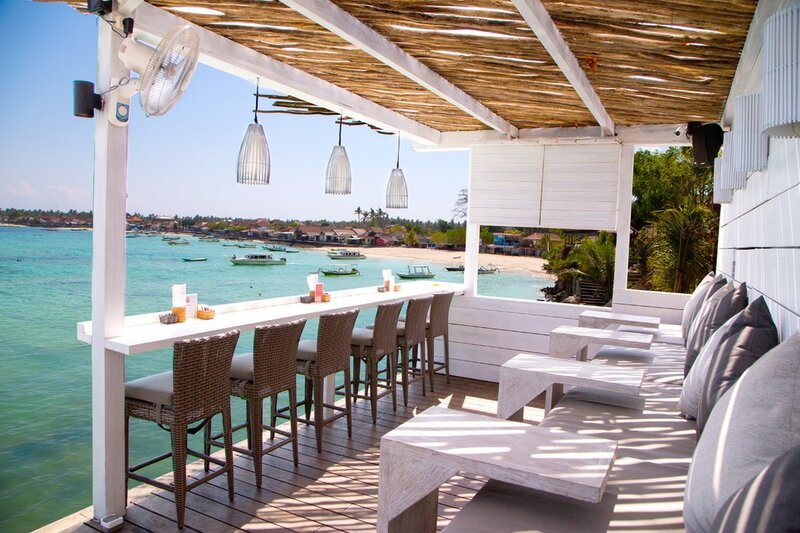 For a wee dram or a gin globe of the finest calibre, this unique dungeon bar on the rocks over the sea is the first in its class on Nusa Lembongan. Whet your tastebuds with a plethora of single malts, as well as a unique gin menu of underground, speakeasy finds. Unique pairings served with class by a touch of Scottish-Balinese character, The Howff is the “secret meeting place” where the old school British West meets in the South East. Wee whisky drams for lads & lassies… "